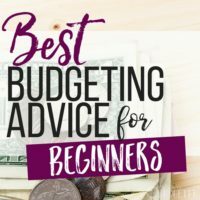 Staying under budget is one of the hardest parts of budgeting. Even people that are awesome at sitting down and making a budget every month struggle with sticking to it. I struggled with it too. I would set unrealistic goals for myself and feel awful when I couldn't meet them. I knew that I could buy groceries for the month to feel all of us for $400. So I would set that budget and then go way over. I would feel like a failure and swear to do better next month and just repeat the cycle all over again. Occasionally, we would have a lot of extra money in a month, either from my side hustles or Jon's over-time. We would set our budget with higher amounts as a treat. I loved those months! I started to notice an unusual pattern. When I set a budget amount over what I thought was reasonable, I would spend less that month than when I set a goal just under what was reasonable. If I usually spent $600/month on groceries and I set a budget for next month of $500 in order to save a $100- I almost always blow the budget AND spend over the usual $600. If I usually spend $600/month on groceries and I set a budget for next month of $700, I almost always come in under $600, (sometimes as low as $350 or 400!) despite having more money to spend. So, when I set the budget to allow myself to spend more, I actually spend less… much less! 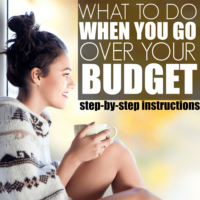 When I restrict myself with the budget, I feel stressed and overwhelmed. I worry about making that amount work. One tiny wrong step (like forgetting my lunch and needing to buy one out), makes me feel like I've blown it and I may as well just do whatever I want. It makes me feel like a failure. The issue here isn't the budget, it's my attitude. But changing the budget is much easier than changing my attitude. Changing my attitude would take years and I'm not even convinced that it's possible. But tricking myself into the desired results works every single time for me. I've successfully done it before with losing weight, ordering delivery, eating fast food, and eating out. I feel like I'm winning. That motivates me to keep winning and to save as much as possible. If I make a tiny wrong step, I know it won't kill me and I move on. And that's half the battle folks. The problem with budgeting isn't calculations. It's knowing ourselves and how we respond to things. Don't force yourself to change things about your personality that have been set in stone since your formative years. Find ways to work around them to get the end result you need. What's your favorite budget trick? I think this is a great idea! I can definitely see it working for me. When I start to do poorly, sometimes I catch myself sabotaging things almost on purpose because I’m so upset with myself. I can see it working for me too! Food is always my weak point, especially when it comes to eating out! I love this tip! I can see how making one mistake can blow the whole budget, but being under budget can be motivating to save more. I am definitely going to implement this strategy going forward. This is a great tip! I find staying within a budget is so difficult yet very important. I love the idea of broadening your expectations with the hopes of succeeding in a stress-free way! Great read! This is fascinating tip thanks for sharing. I will have to check this out. Btw, your site is amazing and full of graphics each one more interesting than the next yet all the content is great! How do u do it. I am very intereated in trying this. My future husband cannot save money to save his life. We’ve been trying to work on it, but I feel like I’m running out of idea. Thank you. This is great advice! I am going to have to try it out myself. I fully agree that success with budgeting is dependent on your attitude. Shared this post. I love your ideas. I shop for a minimum of 14 days at a time from a planned meallist. If I had a larger freezer I’d buy for the month. I have a different approach to budgeting. Start a small garden plot in full sun. Plant 9 packs of broccoli and cauliflowe starts, each 2 ft apart on raised beds. In 2 months, you will have 18 huge veggies plus all the greens from the plants to eat raw in salads, cook or share. FOR a $7 investment, you will have about a $100 amount of fresh, organic produce. I have so much, I have to freeze it or give it away. Does the $7 investment also include the water you use? Very interesting. I think this would be true for me as well. When I start out a month by making bit cuts in our budget (because I’m trying so hard to save), I start out already feeling pinched and overwhelmed. When I just start with a clean slate, knowing I have a little cushion, I definitely have a more positive attitude. I’ll have to put that into practice this month and see if it works! Great idea, I’ve just started to budget and already I feel demoralised when I know I’m going to overspend. Then i tend to give up for the month thinking I’ll start again next month, it’s a bit like dieting! If I allow my self more I may just have more success. You’re perfect for this then Jill! 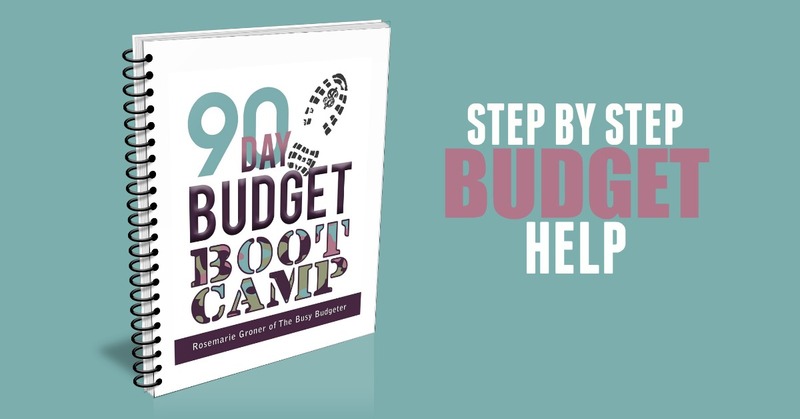 Increase that budget and then reap the rewards! This is a great tip! I will be trying this? Hahaha this is me! Put it into words for me though! I find that I have to use cash for most things. I keep a coupon organizer in my purse and each tab has the amount I’m allowed to spend. Groceries, date night, gas money, etc. I wouldn’t say it’s perfect, but I also don’t end up using the money I have for groceries somewhere else. Do I break out the credit card? Yes, and the guilt isn’t good. Thanks for this budgeting idea. I’m going to try it! That is an awesome idea. I am going to try it. Thank you! I shop every Friday with $100/week. I have my phone’s calculator open and round up prices. If bread is $1.88 I round that up to $2. Just those few cents added to every item saves a ton at the end. Sometimes I leave spending $60 for a weeks worth of groceries. I have always struggled with a budget, being a single mom, I have already cut out as much as I can. Thank you for sharing this, I feel better knowing the I am not the only one who stresses and feels guilty when they go over budget. It’s so encouraging to know I’m not the only one who stresses over tight budgets… It’s true, if there’s a month where we have extra to spend, I feel like I can control the money more. My trick is a *cash only* method. I put my cash for my groceries in an envelope each payday. When the cash is gone I can’t buy anymore. There’s no chance I want to get caught short at the cash register so I’m very aware of what I put in my cart. When you under spend do you leave your money in your general account or move it to savings? 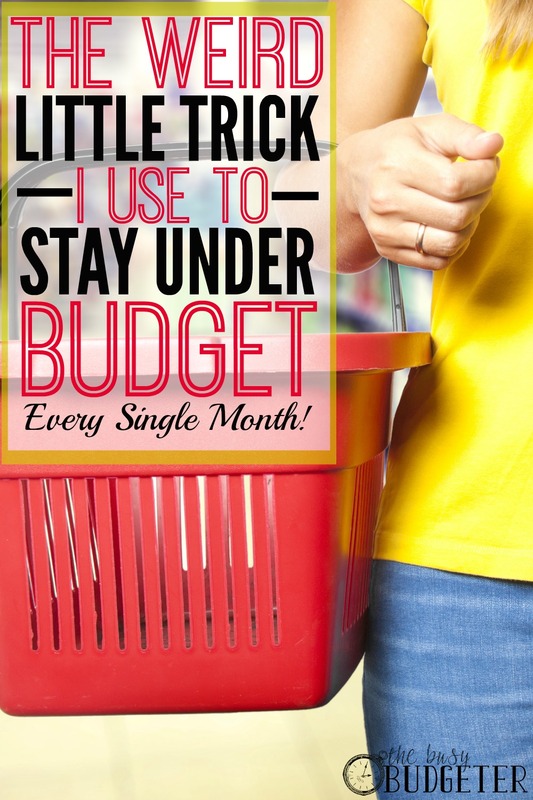 Budget to buy the things your family needs and save for emergency and for things that come up. So this over budget helps you spend way less thats consistency. I want that and will use this method. Thank you. Love this trick. Shows how powerful mindset can be in influencing our spending! I put myself on an automatic investment plan at Charles Schwab and at my employer so that money automatically gets deducted from my paycheck before I’m tempted to spend it. I then prioritized my bill paying to make sure I meet my most pressing obligations (rent, food, student loans, utilities, taxes, etc. not necessarily in this order) first. If I have money left over, I add to my savings for a rainy day. If I come up short one month, I tap into the “rainy day fund,” but I have to call my advisor to free up the cash because I’ve deliberately not tried to learn how to buy and sell stuff. That way, I feel guilty when I call and am less likely to blow my savings on something stupid. This system is really working for me. It’s like my weight loss. My trainer holds me accountable. My adviser does the same for my savings goals. I am terrible with impulse shopping, so this automatic savings method has really helped me out and caused me to accumulate quite a nice nest egg since I started it five years ago. It’s effortless and gives me peace of mind now. Ooh, I love this! I’ve only recently started paying attention to my spending (DINK household 😉 ), and I’ve been struggling with deciding on how much money I ‘should’ be setting for different categories. With the exception of groceries, most of my expenses are either fixed/unavoidable (eg. mortgage, diesel, household bills, etc.) or pretty sporadic (eg. I only buy new clothes a couple of times a year, tops). The one major exception is books. Don’t get me wrong, I love my local library, but I also love supporting authors and I love collecting my favourite books/series. So one month I might spend no money on books, the next I might spend £100; it all depends on when the new releases that I care most about come out and whether I can get what I want from the library or not. I read 2-4 books on average each week, meaning I can easily read £100-worth of books in under a fortnight, so I can’t just say to myself, “Well, it’s not like I’ll read them all the month they’re released anyway, so I’ll just pre-order my three most-anticipated ones and buy the rest the next month” (of course, I *could* limit myself to three a month and otherwise make use of the library, but then I get anxious about it). I think I’ll try setting myself a generous monthly book budget, and then I can just feel smug to myself when I spend under that amount. Oh My Gosh. I adore you. I feel the EXACT same way about books! I’ have three in the house that will likely be finished by Friday. I’m obsessed. Glad to know it’s not just me! Not sure if you’ll see this, but maybe once you read the books, you can sell them, even if you don’t get the full amount back, you will have some for your next books. I unfortunately have not been able to download the course using provided order download link here : https://transactions.sendowl.com/orders/11483436/download/9f8ef5f00d6190ae8c70b116a8cd4046 because the link expired. I will like to request a new link be sent to my email so I can download the product. I am sorry having to use the comment section to get in touch but I used the contact form and have not received any response! Oh no! Sending it now! Sorry for the delay. We got slammed with emails today. Sending it now! Wow that’s a really weird trick that I will need to check out. Thanks for sharing!!! I read about your success on http://www.sidehustlenation.com. I’m in the process of monetizing my blog currently. I’d love for your readers to take a look – http://www.fiscallyfitchica.com. Thanks! i totally agree with this and could definitely see why this would work. Thanks for sharing. i have a feeling this will work great for me. I spend twenty dollars a week to feed myself. No processed foods or meat. I eat whatever is in season, and buy one pantry item a week, like flour or pasta or spices for my curry. I make everything from scratch, including bread in my bred maker. I also work full time. $600 a month for food is insane! Start a garden. Make your own jams and preserves. Their is no excuse for that kind of spending unless you have ten children. I love this statement. Since before adulthood i have struggled with the battle between being highly ambitious and having lofty goals, and the reality of my procrastination and laziness! This articles was very helpful in many ways! Do you make the math work out in the end to allow for this bigger budget… or trust that you will spend under what you have budgeted? 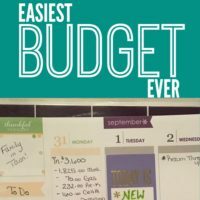 I love the mental tricks that help meet budget goals. It really does give you small wins, which keeps the motivation going! 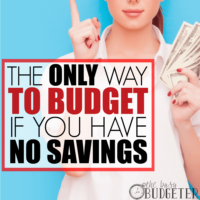 The biggest budget “a-ha” moment for me was when I started treating my personal budget like I do with my one at work… zero-based budgeting where anything I buy is given a lot of thought or it’s on the “essential” list. Then I consider the principles of the Latte Factor, which also had a big impact on my mindset. Thanks for the helpful tip! I’ve never thought of thinking about it that way! That makes a lot of sense, though. Exactly! If you cut down your budget too extreme too quickly it’s easier to stress out and not meet your goals. If you slowly cut back, you can trim it much more consistently every month or two. This is an interesting tip and concept! I am sure it would work for some types of people, but others might get excited and overspend the money that they think they now have to spend! That’s true 🙂 Thanks for your input! Sounds like you fall for the scarcity belief. If you believe something is rare or in short supply,you want it more. Great way to trick yourself. The pitfall in my budget is if the kids are with me shopping, or if I’m in a hurry and I don’t mentally keep track, I always get up to the register, run out of grocery money and have to take it from my personal spending. Ugh. Hate that!